Browse: Home / Set-Up for Posts / The Millennial WhipperSnapper Interviewing the 50+ Aged Worker! « Black Hole Gulping Your Resume? Just like people from different parts of the world fundamentally think, eat, talk, and act differently – so go people from the same part of the world, but from different generations. In today’s workplace, we have The Silent Generation dubbed The Greatest Generation (born before 1946); the Baby-Boomers followed; then, Gen-X and now Gen-Y, called the Millennials. 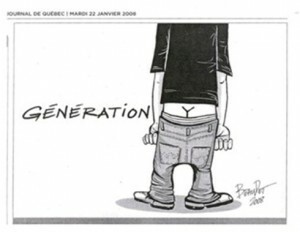 The picture depicts why they’re called Generation-Y. 1. Gen-X and Gen-Y are digital natives; we are digital immigrants. We must communicate in the way that millennials do. Even in a professional environment a text message or an email may be just as effective as an in-person conversation. Indeed, they don’t write personal thank you notes, but they SHOULD get one from you. 2. For us…work-life balance is imperative. For millennials, this is an obsolete term…it’s more like work-life integration. So, don’t be put off by their midnight emails. Allow them their freedom and agree upon clear expectations for desired results…and don’t mention how you would do it. 3. “Because I said so” does not sit well with millennials. They NEED to understand WHY. Explaining the impact generates buy-in and motivation. Appreicate and channel a millennial’s (whether interviewer or interview-ee) energy, focus their creativity, and use their desire to gain experience to reach YOUR goals. 4. Show that you understand technology. Beyond illustrating how you understand the Microsoft Office Suite, you want to make sure to understand and talk about technology and its importance in the workplace. Show that you have an open mind, i.e. social networking, etc. Really do it, don’t try to sound ‘hip’ – they probably don’t even know what that means. 6. Be flexible and comfortable with change. If you’re not; stop it, adapt. The ability to be flexible and change quickly is much more important to a millennial than being strong and staying the course. We change when the pain of the present exceeds the fear of the future; they change in a heartbeat, so answer questions by referencing examples from multiple positions on an issue. In today’s world, only the agile (not the strong) will survive. 7. In interview, discuss corporate cultures. Make references to the variety of things you like and talk about passions you have and who you are outside of work, i.e. if you tell them about mountain climbing, river rafting, or traveling to 10 countries, it will help brand you in a more positive way. So, remember that no matter what your age or amount of professional experience, you can always show that you are flexible, intelligent, and young at heart while still communicationg that you have the solid experience and resulting judgement that will make you successful. And, don’t complain about 10 pm telephone calls and midnight emails. Most importanly, remember that today’s 50+ aged worker is more in demand than ever in our lives. Things that happen in life are like casino chips. My father, at the end of the day, was like the cashier. Our talks kind of validated the day or week.